I just missed a nice photo opportunity. 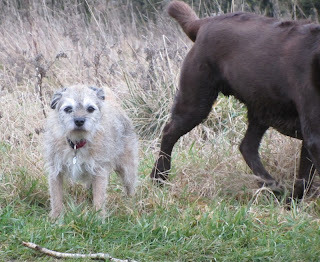 There were two large dark dogs, and Harry was looking between them at me. But the camera takes a second or two to turn on and point. I caught Harry a moment later when the big dogs had moved away. Harry is far more interested in big dogs than dogs his own size. He even drops his stick to follow them. figures they may teach him how to be a big dog. Maybe they tell good jokes? In any case, big dogs gotta be more interesting than a dumb stick.